Nissan ttook the wraps off another NISMO concept car at the Tokyo Motor Show – a sporty version of its LEAF electric car. Thanksgiving didn’t have much to offer by way of thanks for about 125 employees of A123 (AONE) who were laid off from the lithium-ion battery maker’s Livonia and Romulus, Michigan factories last week. The Prius PHV, Toyota’s first plug-in hybrid, will be available for order in Japan as of January 30, after its debut that hit just before this week’s Tokyo Motor Show. NORMAL — The town is accepting applications for a program that provides free electric vehicle charging stations to businesses and organizations. Recipients are responsible for the cost of installation, ongoing maintenance and required signs, and must make the stations available for free for at least five years. Mayor Boris Johnson has often referred to his hopes of London becoming the ‘electric car capital of Europe’ and now plans are underway for a network of wireless charging points for electric cars and bicycles. The city council will decide next week whether to sign off on a municipal license agreement to bring two charging stations to Shelbyville for electric vehicles. The best part of the deal is that it won’t cost the city a penny. HUNTERSVILLE, N.C., Nov 29, 2011 (GlobeNewswire via COMTEX) — Lime Energy Co. /quotes/zigman/109293/quotes/nls/lime LIME +2.33% announced today completion of the design and installation of 90 electric vehicle charging stations in four states. The final two of six new electric car charging stations are now installed in Edmonds. They are at the corner of Main Street and Sixth Avenue South. With over 20,000 Leafs running around the planet, Nissan is looking to introduce yet another alt-powered vehicle to the world, and judging by its recent work with fuel cells, a hydrogen-powered vehicle could be here in four year’s time. The Nissan Leaf may not look like a powerhouse, but it appears it can actually power a house. Nissan’s EV can provide power to a household for two days, and even help save money on electricity bills by up to 50 percent. 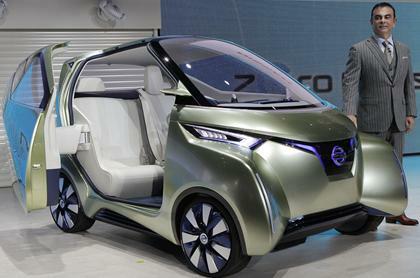 Nissan-Renault CEO Carlos Ghosn approaches the Nissan Pivo3 electric commuter concept. Find out which vehicles still have tax credits available. ALTON, IL. (KPLR11.com)— Gas prices are up from a year ago. While gas stations are on every corner, charging stations for plug-in cars are not. What is an electric vehicle owner to do? 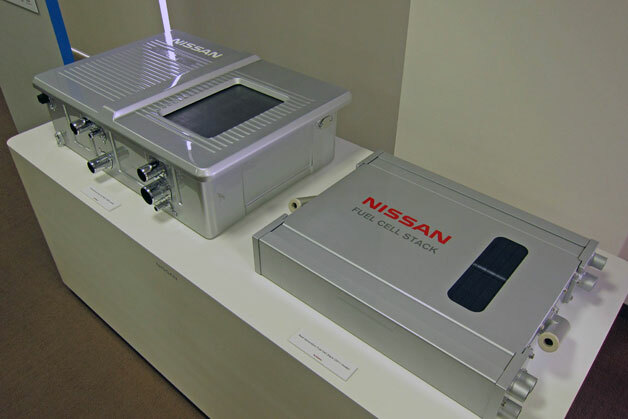 Nissan has showcased clever new technology that will allow a Nissan Leaf to power a household on its own for up to two days. The new technology, known as Home Smart Charging, will be available in Japan from as early as summer 2012. The Bay Area wants to be known at the “Electric Vehicle (EV) capital of the United States.” To that end, area elected and business leaders recently announced the launch of a CEO-level “EV Strategic Council” along with $5 million in new funding. The current sales figures for all these toaster-like contraption that we call EVs are nothing to shout about, though the Nissan Leaf has managed to play some good notes to its potential customers and as a result it’s picking up orders left and right, though primarily from the public sector. Mitsubishi has shown off an updated version of its plug-in hybrid PX-MiEV II concept at the Tokyo motor show. The Concept PX-MiEV II is a development of the original PX-MiEV concept shown at the 2009 Tokyo motor show.